Ooh, and I forgot to say that I’ve signed up for next term, and even better, persuaded my Graham to sign up too! I know that only too well Jay!! Umm, which Flintstone was I though??? Bamm Bamm - or Dino maybe. I’ve been a bit under the weather this week and was disappointed not to be able to make it to the class yesterday, especially as it was the final class for this term. Still, I’m looking forward to next term’s classes that start up mid-January. Graham popped to the Education Centre after work today and picked up the two pieces that I made last week. There was the ‘inclusion’ which was a copper foil bird and cherry-red frit... and also my first attempt at ‘kiln-carving’. Ooh very nice Helen. Very creative of you. I finally got my Christmas present today, well ‘presents’ really. Graham took me to Tempsford Stained Glass store in Bedford. 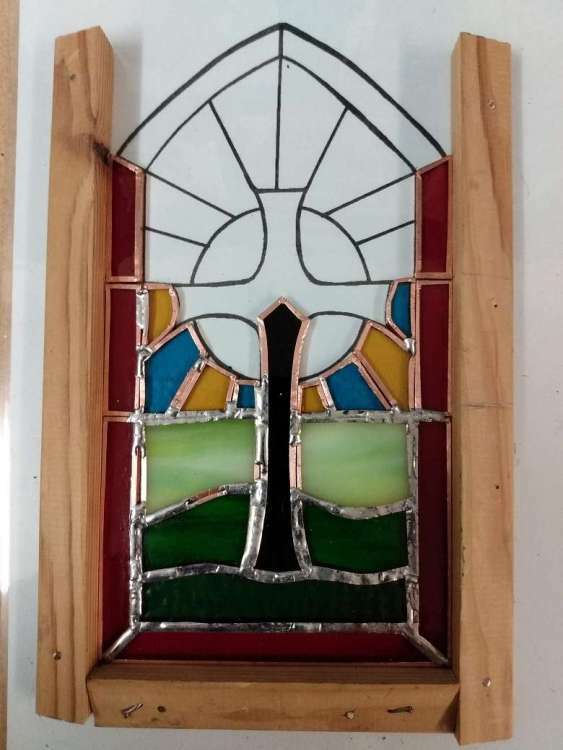 We bought a starter kit for making copper foil stained glass containing all the essentials...glass, glass cutter, soldering iron and lots, lots more, also bought a grinder. Father Christmas has excelled himself despite being a bit late. How wonderful Helen. Sounds very exciting. Classes started up again last week. Graham has signed up this term too, so he’s starting on the same couple of projects that I did last term. 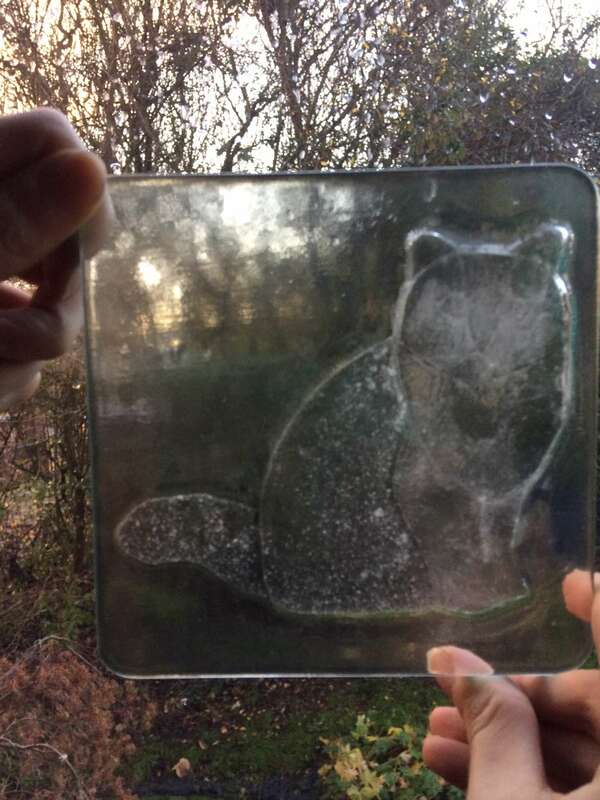 Last week he and other newcomers were just learning to cut glass. This week they have started their first lead panel. I, on the other hand, am free to choose my own projects. I thought I’d start with a copper foil cat. I cut out the glass last week and ground the pieces to fit together well. This week was spent sticking the copper foil strip around the edges and soldering. Almost finished, just need to solder on a hook onto it next week. That’s a fiddly job so I didn’t want to rush it. Now...what shall I do next week? Enjoying hearing how this is going and seeing what you’re making. Are you generally into crafts? I did a bit of cross stitch a long while ago. My mum used to sew and knit but it didn’t rub off on me. Whereas my niece makes the most amazing things and has a room in her house just for her crafting some of which she sells on Etsy. I started a while ago on a (too ambitious) cross stitch project and though I made quite a bit of progress I have never got around to completing it. My eyesight is getting worse...must go for an eye test! I would like to say I’m into crafts, but I’m not really living up to the family standard. My Mam was a wonderful knitter and seamstress. I must try and scan some photos of some of the very smart clothes that she made for me when I was younger. We used to get every edition of the Vogue Pattern Book when I was in my teens and early twenties. It’s just a reflection of my laziness and working in a ‘dress down’ environment that I’ve turned into a very sloppy ‘casual clothes girl’ as I’ve got older. I liked being able to choose the pattern, because my Grandmother (Nain) didn’t use patterns, being a professional seamstress, so she tended to make what was in her head rather than what I had visualised. She was always fashion savvy though. I remember her taking a cast-off pair of straight slacks (this was at the height of the bell-bottom 70s) and not only adapting them to fit me but also turning them into an ‘up to the minute’ pair of trews by letting in a contrasting fabric to the lower leg and adding matching rear pockets. Mam made my wedding dress and going away outfit. Nain made my bridesmaids dresses. At one time Nain tailored an exceptional suit for Graham (I’d even persuaded her to use a designer Vogue Pattern). I’d miraculously managed to get hold of a bale of a very good quality woollen suiting cloth at a very reasonable cost at from a Yorkshire mill in the late 80s, through a chance introduction whilst staying with a Uni friend in Huddersfield. My Mam didn’t rate her talents at all. Maybe because not only her Mam but also her Nain has been professional seamstresses. My Nain continued to sew through into her 80s...literately until she couldn’t do it anymore because of the arthritis in her hands. Mam bought her electric scissors that helped her carry on through her 70’s and 80’s. During her career Nain had made clothes for some of the more wealthy ladies around the area and also soft furnishings (curtains and chair/sofa covers). In the 30s and 40s she used to make costumes for a local theatre company and the dresses for the local May Day Queens and Maids. To be honest, I wasn’t that close to my Nain when I was little. I think she was afraid that I was being spoilt, my Mam having been widowed and all that, so she was a bit strict with me compared to my Grandad, who was such an exceptionally gentle man (I.e. a real softie) and my Dad’s Mam who as just a genius with children and had an impish sense of humour (inherited by my cousins and my son Alec). However, as I’ve got older I appreciate my Mam’s Mam even more than I did when she was alive. She carried on working to help my Mam out. Despite having left school at 14 she had an interest in literature and read a lot, including Welsh and English poetry, so I credit her with encouraging me to read and my ending up doing an English Lit degree as well as having an appreciation of Welsh poetry and culture. My Grandad (Taid) was into music, so that’s where we get the brass band playing from. Nain also developed some very close friendships with some of the ladies that she sewed for, they used to regularly call in at her (small terraced) house for a chat if they were in town, and they were very kind to her bringing along the occasional gift. One lady gave me a fox fur jacket that she had treasured when she was younger. Nain was also a role model in caring. Though she normally sewed 9-5, when I was a teen there was a period when I recall her spending time each day with a younger neighbour who was dying of cancer. Graham’s Mum was also very talented crafts wise, especially with crochet and knitting. I have some very intricate and delicate crochet pieces that she made. I also find it interesting that her Mother was a porcelain worker at the Royal Worcester factory before her marriage. Hmm...well that unexpectedly turned out into a bit of a wallow into family memories. Sorry! Fascinating reading. I’ll message you as soon as I get some time off my phone and back on my computer. However, as I started to cut out the paper pattern I realised it would be almost impossible to cut it out in glass. 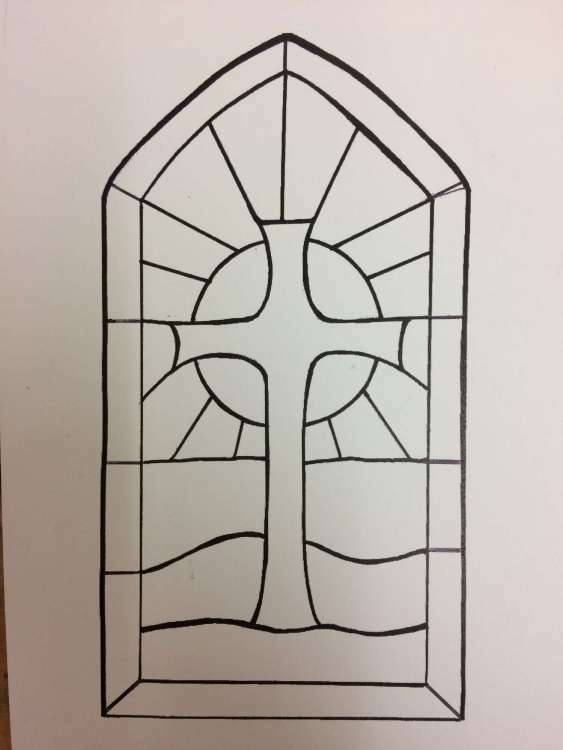 From the photo above you see that the lines radiating from the upper half cross don’t run from the corners, so you’d be trying to cut a corner out of the glass. That just doesn’t work. So I started again with a different pattern. 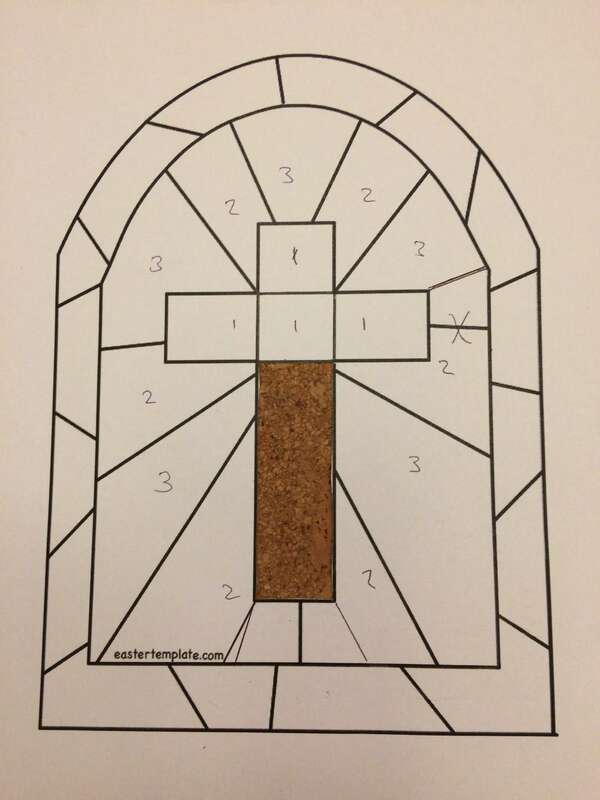 I also decided not to try to cut out the cross in the new pattern in one piece, though the tutor said it was possible. 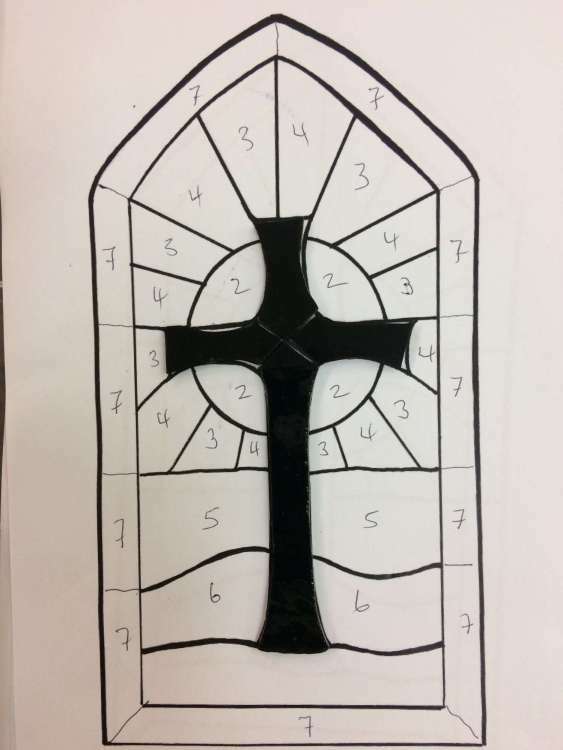 Spent the rest of the evening deciding what colours to use and started cutting out the cross in black glass. 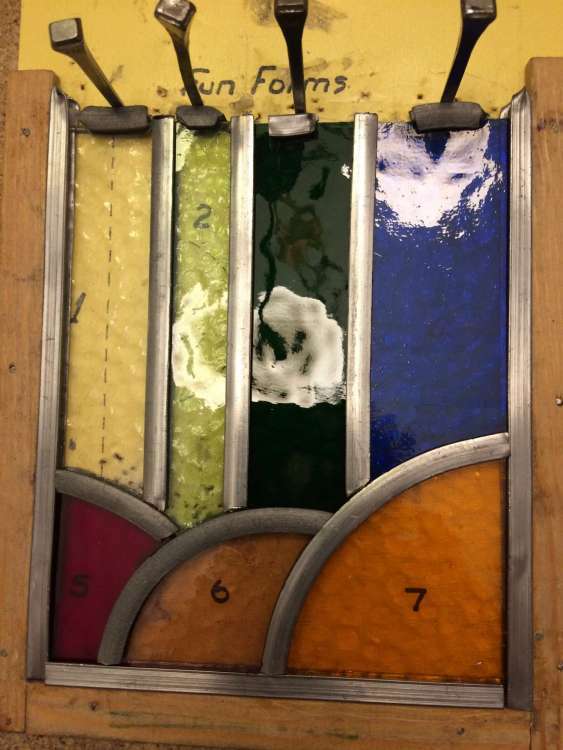 The rest will be in yellows, orange, blue and green, and red around the edges, though I didn’t have any red glass. I have now...we went to the Tempsford Stained Glass store in Bedford this afternoon . 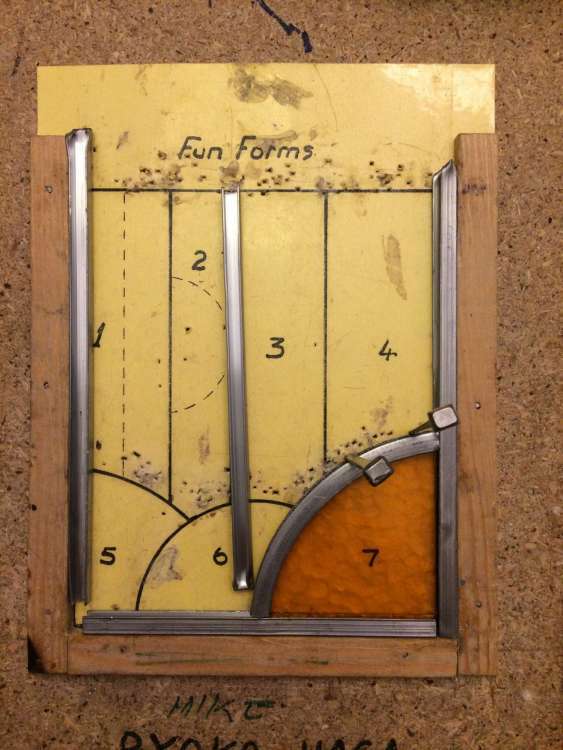 Graham is taking far more time and care making his first piece, and consequently making a far better job of it. I am really enjoying this thread Helen! Are any of you crafty readers interested in making Little Dresses for Africa btw? This charity aims to provide garments that girls can wear, apparently it helps protect them if they look well dressed . If so pm me your email and I will send you a pattern that the charity is advocating. What kind of size will the finished product be? That's about 5 inches by 9 inches then, I reckon. Even all those many years ago I was only taught metric at school ... but I still find myself converting centimetres back to inches to visualise things. 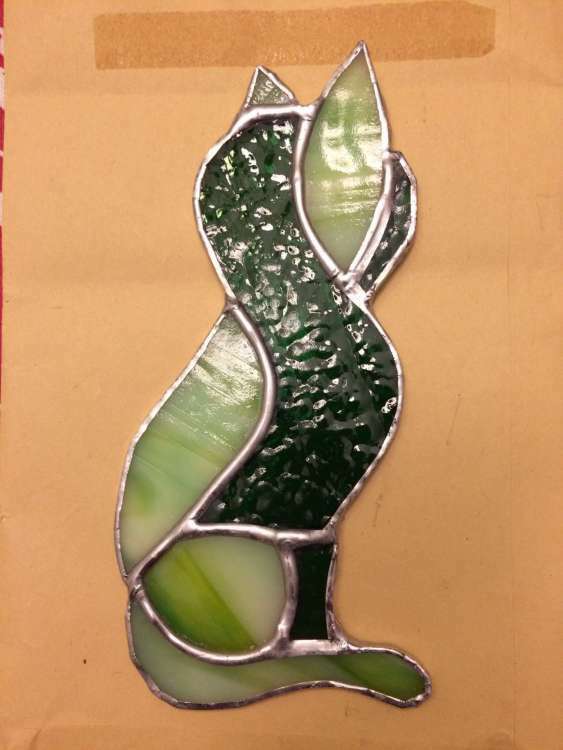 I've been very lazy about posting up about how our Stained Glass classes are going this term. 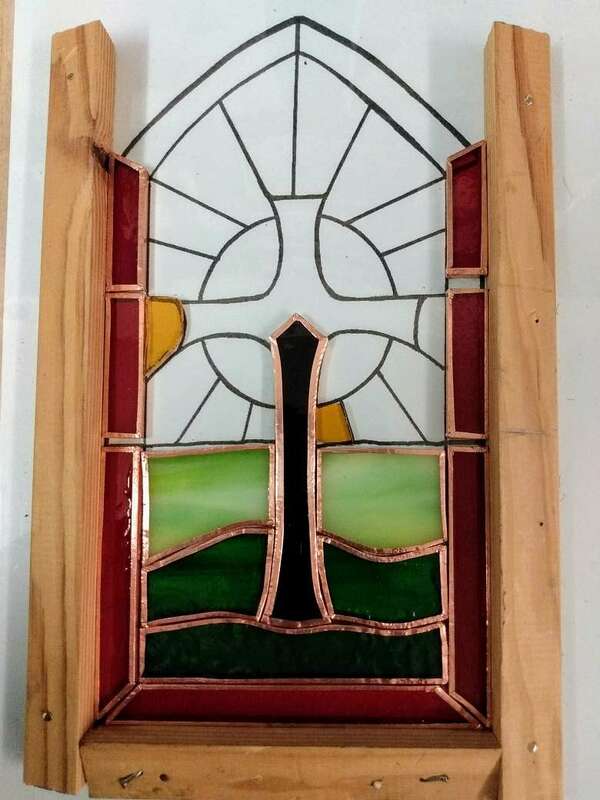 The cross panel that I started off early in the term has taken ages - lots of smallish pieces to first cut, and then the edges needed grinding to make sure each piece fits fairly well, then I had to put copper foil around each piece. 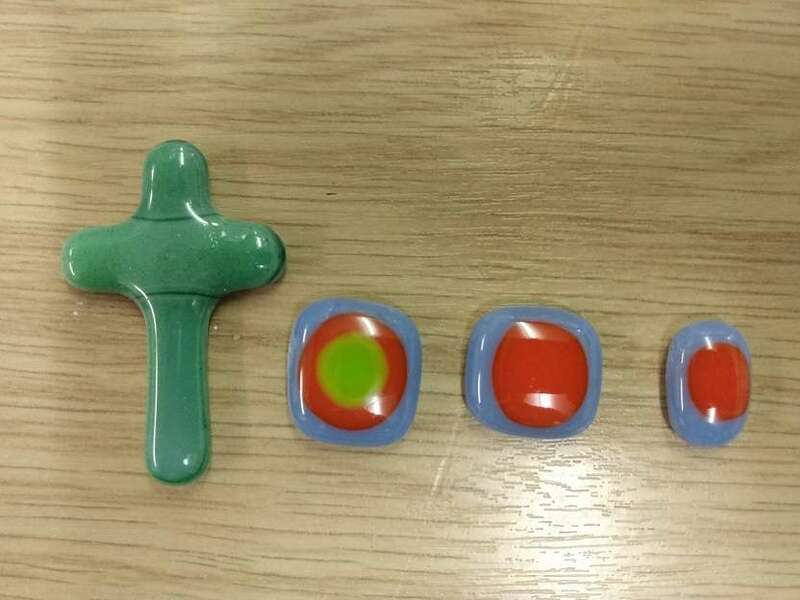 I also got distracted by starting to try out a few fused glass pieces. This is how far I've got with the cross: two pics from last Thursday, one with just the copper foil around the pieces and a second showing what it looked like at the end of the session when I'd started to put some solder on it to join the pieces together. Also some pics of a few of my experiments with fusing. I started off trying to make some jewellery. I can buy some silver plate 'bails' to stick on the back of these to run a chain or leather thong through. 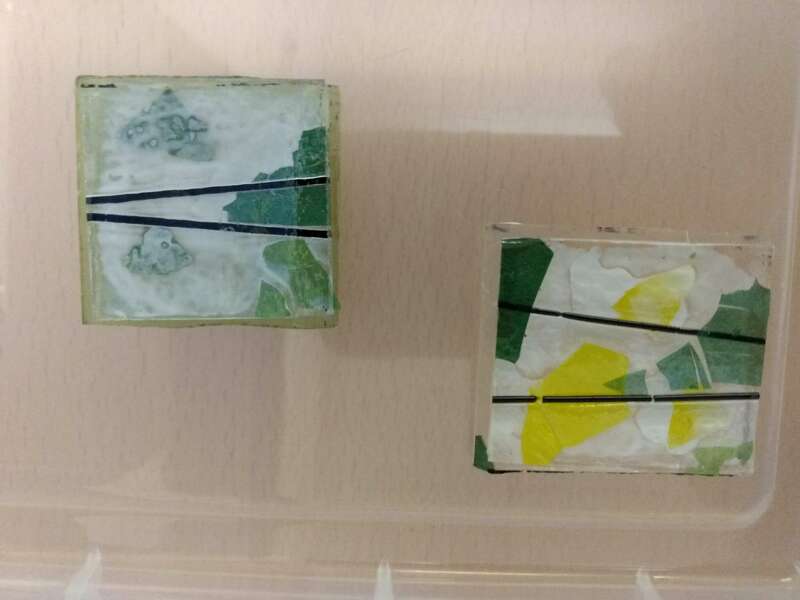 I've shown a before and after of the first couple of pieces that I did (green and blue), which shows how the full-fuse in the kiln slumps the layers together and rounds off the edges. 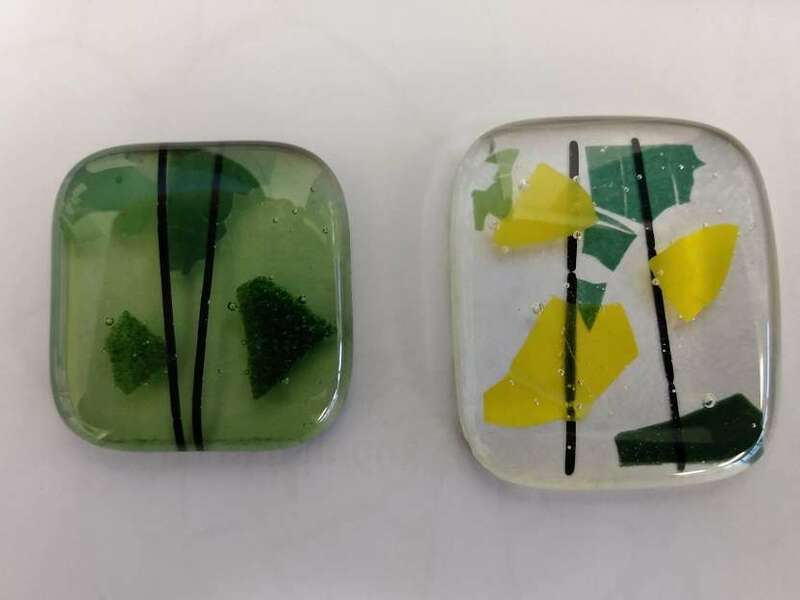 And also a couple of pieces with clear glass that I layered together with some fine 'confetti' glass between. They look cloudy in the 'before' picture because I stuck them together with PVA glue. 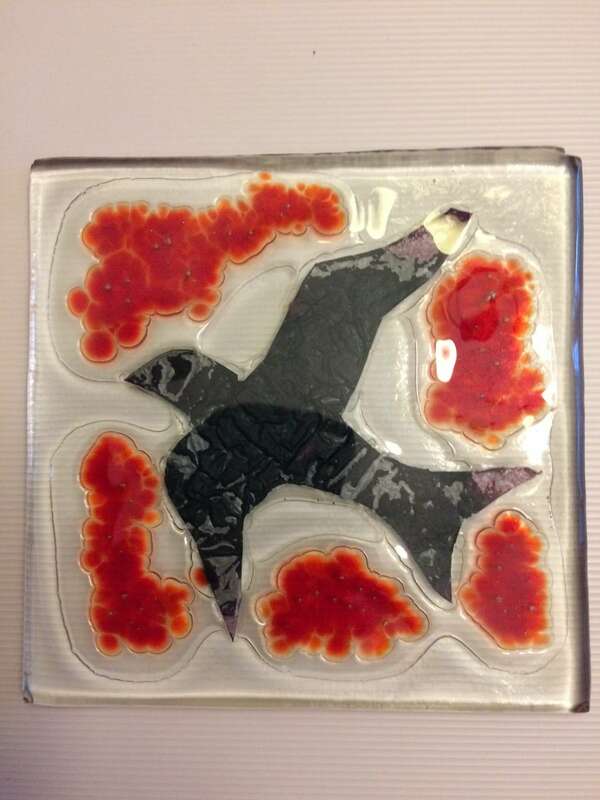 It's exciting seeing the pieces that have been in the kiln - you never know how they will turn out. I'm hoping to buy some dichroic glass before next term. It's multicoloured and gives an iridescent effect. Good for making jewellery. Graham made a copper foil butterfly, very similar to the one that I made (but better, as he takes more time and care than I do). He's spent the last couple of weeks meticulously cutting out patterns to make a collie dog picture using fused glass. It looks very ambitious, so I will take some photos if it turns out well. We have both signed up for next terms again.